along the way. 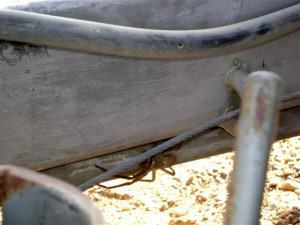 Track conditions are usually good although the road is corrugated and then there is the dust. The Oodnadatta Track gives a whole new meaning to the word “dust”! We bounced and shook our way through Wangianna, where there are some ruins of fettler’s quarters to be seen, and Callana, a sheep station, two stops along the Old Ghan Railway Line, and it wasn’t long before we arrived at Alberrie Creek, where the Mutonia Sculpture Park is located. or junk that is available and Robin has said that if Australia ever runs out of waste, he’ll be out of a job! Enter the park through Kombi Gate, a real Kombi van that has been sliced in half, lengthwise, and positioned to form the gate. 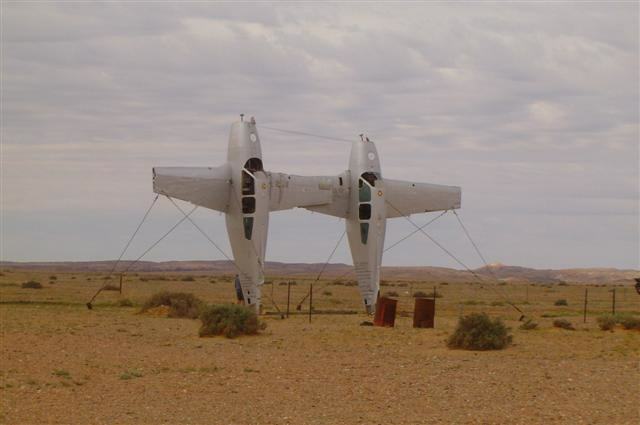 Be amazed by such wonders as Plane Henge, 2 Beechcraft Baron light aircraft standing on their tails, The Big Dog, made from a water tank, and a man made out of car parts, among many others. A fascinating place to see and we wandered around for quite a while. 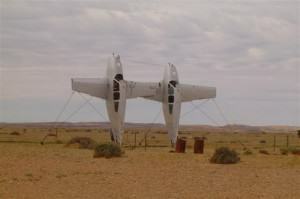 I especially liked Plane Henge! We continued on and before too long were at the intersection of the Track and the Borefield Road, some 70 kilometres (44 miles) from Marree. Borefield Road leads to the South Australian town of Roxby Downs. We decided to stop here for a coffee break and discovered that our caravan was full of red dust, a dust so fine as to be almost like talcum powder. John commented that it was called bulldust; I had a somewhat less elegant name in mind! There was no point being upset about it and 45 minutes and a lot of cleaning and grumbling later resumed our journey on the Oodnadatta Track and continued on to William Creek. The track itself isn’t THAT bad but we still bounced our way over corrugations, through dips in the road, and across dry creek beds, all the time leaving a huge dust cloud in our wake. The land, hot, dry, and barren, stretched endlessly all around us and it’s a pretty lonely and desolate stretch of ground. It can be scary and I don’t even want to think about what it’s like at night. 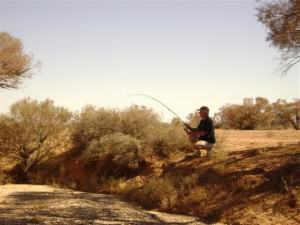 William Creek is a tiny outback town that is mainly only a stopping point on the track. It is situated on the world’s largest cattle station, the 32,500 square kilometre (12,550 square miles) Anna Creek Station. 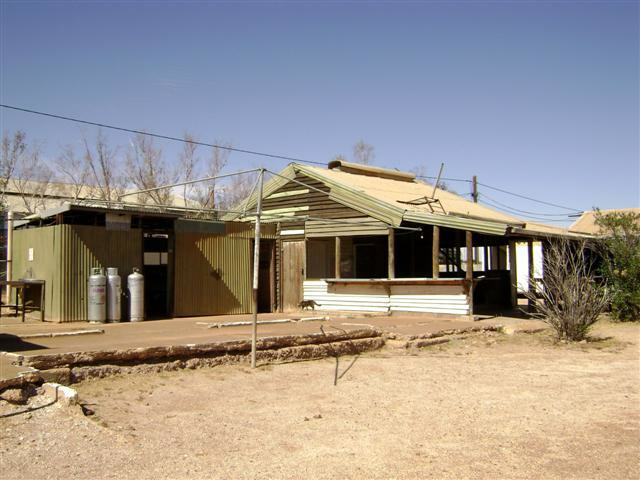 The town itself is exactly halfway between Oodnadatta and Marree and consists of a timber and corrugated iron pub dating from 1887 (there’s always a pub!) and an outdoor museum where you can view historical gravesites, memorabilia, and find out how many kilometres you are from your home town! 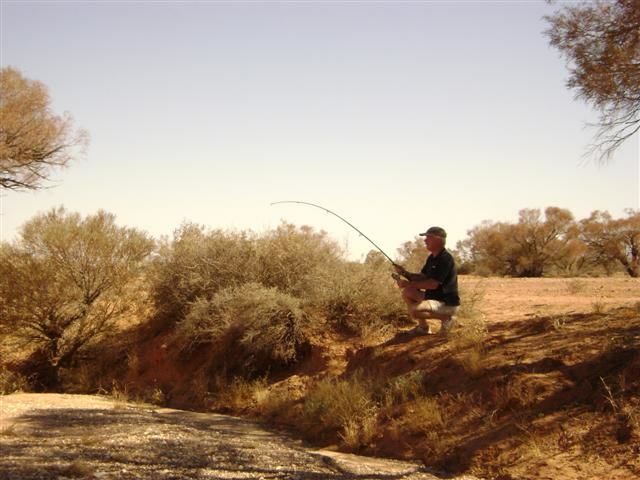 William Creek is the closest settlement to Lake Eyre, a mere 53 kilometres (33 miles) away. Lake Eyre is another of those Aussie icons. The lowest point in Australia at 15 metres (49 feet) below sea level, it is a giant basin where all the inland rivers converge into a monstrous pool. For years on end it’s nothing but a crusty saltpan but when the rains come, especially in times of flood, the lake fills with water, sometimes to a depth of 4 metres (13 feet). Over the years Lake Eyre has been the site of various land speed record attempts on its salt flats, including the attempts by Donald Campbell and his famous “Bluebird”. We decided to stop in William Creek for lunch but, unfortunately, didn’t have time to make the trek out to Lake Eyre. It was hot, dry, and dusty at William Creek and the flies almost drove us crazy. But we still made time to wander around and explore. Not that there was much to see but the stop was definitely worth it if only to give our aching bodies a rest from all the bouncing. 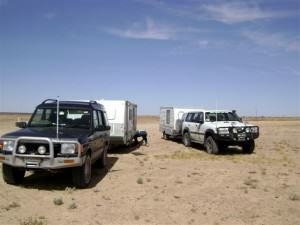 But it wasn’t long before we were on our way again and heading for Oodnadatta. 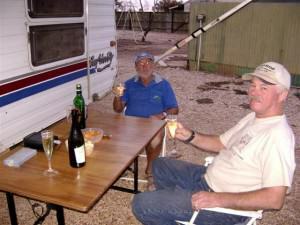 We arrived late in the day and checked in at the Pink Roadhouse Caravan Park (no stars). This is where we received proof positive that travel brochures do tell lies. 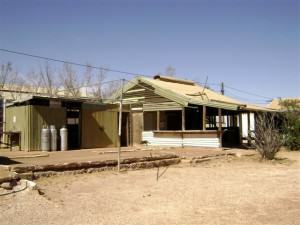 This wonderful caravan park at the famous (or infamous) Pink Roadhouse left a great deal to be desired. There is no word in the English language to describe it. Abysmal and abhorrent are two that come to mind. So does derelict and disgusting. But none of them even come close to describing the place. Nothing, and I mean absolutely nothing, has been cleaned in a very long time. It’s bad when you have to clean the bathroom BEFORE you use it. And don’t get me started on the laundry and the camp kitchen! I almost cried when I saw this horrible place! It’s the first time on any of our trips where I have said to John, “I want to go home”. Oodnadatta’s Pink Roadhouse is such a well-known place that I can’t believe that they have made no effort to make the caravan park at least acceptable. We had paid for a 2-night stay before we’d seen the caravan park and for a while I contemplated asking for our money back but we couldn’t come to Oodnadatta and not explore. So stay we did and found that the accommodation was the only thing here that disappointed us. The evening was warm and, along with our travelling companion, we sat outside and toasted our arrival with our bottle of Two Tails Sparkling Wine. The next afternoon we went for a drive out to the Angle Pole Memorial. On the track and about 8 kilometres (5 miles) from town this is a memorial to the men and women involved in the construction of the Overland Telegraph Line in 1874. It was the site of the original terminus for the rail and also for the township that had been planned near the waterhole. There is a tree on the site that was marked by the West Australian explorer John Forrest at the time of the construction. Approximately 185 kilometres (115 miles) to the north of Oodnadatta is the Witjira National Park and Dalhousie Springs. This is a popular swimming spot in cooler months with its permanent water temperature of 37°C (98.6°F). We didn’t drive up there this time but filed the information away for next time. There are a large number of dry creek beds and crossings along the track and we made a stop at Six-Mile Creek on the way back to camp so that John could fish. Yes, you heard right. Now, I don’t know what he expected to catch in a dry creek bed but he was determined to throw in a line. Talk about a die-hard angler! 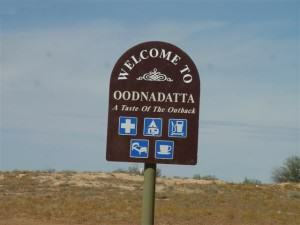 The land here is flat and arid and it stretches endlessly but there is still much to see in Oodnadatta. It has retained a lot of its pioneering character from the largely Aboriginal population to the railway station building made from sand-stone. The town was an important railhead between 1891 and 1929 but before then camels, bicycles, and horse-drawn buggies were used. The Oodnadatta Railway Station Museum has a large range of photographs of those days. We wandered down to have a look at the museum but it was closed. The sign on the door said there was a number we could call for a tour but we decided against it. 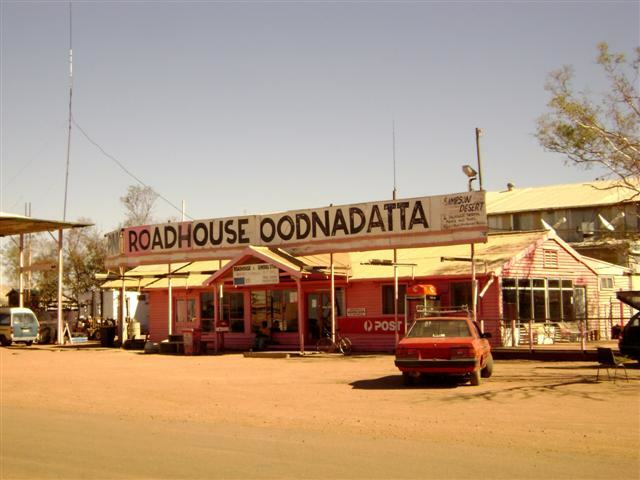 The town of Oodnadatta includes a supermarket (of sorts), the Oodnadatta Store, a hospital/medical centre, a telecentre, and the Transcontinental Hotel where the resident owners are happy for you to meet their pet kangaroos. But it’s the Pink Roadhouse that entices travellers. 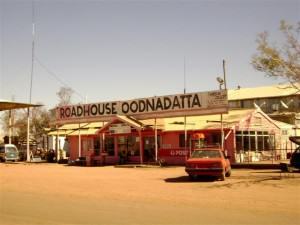 Central to everything in Oodnadatta, it’s a one-stop shop, including licensed restaurant, service station, information centre, and the afore-mentioned caravan park. Obviously, the theme is pink, with everything from pink hats to pink fly veils. The legendary owners, Adam and Lynnie Plate, as the story goes, came to the outback on camels in the 1970’s and never left. Sadly, Adam Plate passed away in August 2012. The sun was starting to set in one of those blazing outback sunsets that take your breath away as we returned to camp and after a light dinner we settled in for a quiet evening and an early night with the prospect of a lot more shake, rattle, and roll to come the next day. As darkness fell, the silence engulfed us and the panoramic vista of the outback sky sparkled overhead. We got away from Oodnadatta early the next morning and headed towards Marla, the end of the track, some 210 kilometres (130 miles) away. 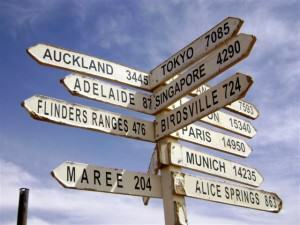 Marla is only 159 kilometres (100 miles) south of the Northern Territory border and is merely a stopover point for travellers. We set off down the track and really saw nothing much more than we’d seen on our way in to Oodnadatta but we did have a moment when we stopped for a break and discovered a hitchhiker. How long this spider had been on the drawbar of our van, and where he had come from, was anybody’s guess but we relocated him to the ground and he scurried away. I guess bouncing out of his britches on this track was not to his liking either. The Stuart Highway, at last! We passed through floodplains and the tributaries of a couple of river along the final stretch of the track and a little over four hours after leaving Oodnadatta we reached the sealed road and not long after that were on the Stuart Highway. The Oodnadatta Track is certainly no highway but it was an experience we wouldn’t have missed for the world. The caravan park left one heck of a lot to be desired; just being clean would have been a good start. But there’s quite a lot to see and do in the town and the people are friendly. Would we do it again? . . . Let me get back to you on that!